Why Do Mosquitoes Seem To Prefer Biting People Who Are Infected With Malaria? : Goats and Soda Researchers are trying to figure out what makes a mosquito more likely to bite people infected with malaria. 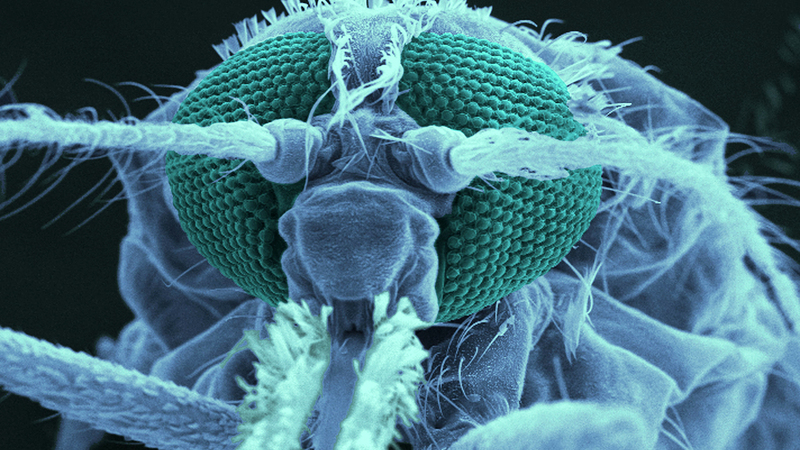 A mosquito's antenna responds to odors. Scientists are trying to figure out how the malaria parasite might trigger a change in body odor that draws in mosquitoes that carry the disease, like the Anopheles skeeter pictured above. They made children wear socks until they got good and smelly. Later on, they decapitated mosquitoes. Those were two steps in an ... unusual ... study to learn why female mosquitoes (males don't bite) are more likely to feed on people with malaria than non-infected people. "Insects live in this hidden world of communication, they're flying through an aerial soup of chemicals," says James Logan, who studies mosquitoes and the diseases they spread at the London School of Hygiene and Tropical Medicine. Mosquitoes move through this chaotic olfactory world using their antennae — the organs responsible for their sophisticated sense of smell. But what brings a mosquito in for the bite? "What we didn't know was which chemicals in body odor were responsible," says Logan. Body odor is complex, and "the tricky bit is picking out which ones are important for mosquitoes." Logan and colleagues from the U.K., Netherlands, and Kenya have just unlocked part of this long-standing mystery. It turns out that mosquitoes respond to certain chemicals — including heptanal, octanal and nonanal — that are part of a group called aldehydes. These aldehydes are normally present in all people but were given off in greater quantities by malaria-infected children involved in the study. "It's a great first step," says Christopher Potter, a neuroscientist at Johns Hopkins University School of Medicine who studies mosquito olfaction and was not part of the study. "The fact that they've identified some odorants is pretty exciting." The research team tested schoolchildren in Western Kenya for malaria and gave them a pair of socks to wear overnight, to soak up their body odor. The researchers found that mosquitoes were much more attracted to socks from children with active malaria infections — and were less interested in socks worn by children who had been treated and cured of their malaria infection. "Having those kids in our field labs, it felt like we were taking an important step in understanding how malaria transmission works," says Jetske de Boer, an entomologist at the Netherlands Institute of Ecology, who was also part of this study. According to de Boer, somewhere between a third to half the children sampled on any given day were infected with malaria, even though they were asymptomatic. To pinpoint the exact chemicals involved, the scientists took a second sample from the kids – this time putting plastic bags around their feet to collect body odor samples. Then they headed back to the lab, where they analyzed the contents of the bags and identified aldehydes that were more abundant in the foot odor of children infected with malaria. And how did they measure the mosquito reaction to the smell from the bags? This is where the decapitated mosquitoes come in. The researchers hooked up the cut-off mosquito heads and antennae to circuitry. The mosquito heads would stay alive for 20-30 minutes – enough time for the researchers to blow puffs of air samples from the Kenyan children's feet and also of carefully balanced compositions of aldehyde chemicals. The goal was to see which air puffs caused electrical signals to pass through the antenna nerve cells – a sign that the chemicals in the air puff cause a physical reaction in the mosquitoes, which the researchers suspect might be to go in for the feed. But the results of this series of tests weren't definitive. For example, only certain concentrations of the chemical heptanal, added to the body odor of children who weren't infected, could trigger a response in the antenna. So researchers suspect that it's not just the chemicals churned up by the malaria parasites, it's also a matter of how those chemicals interact with human body odor. Another thing the researchers aren't sure about is the mechanism that Plasmodium parasites in our blood stream use to change the chemicals on our skin that cause body odor – and whether the chemicals that attracted mosquitoes in the lab would be similarly alluring in the real world. Logan, de Boer and their colleagues plan to continue tweaking their research on mosquito bait traps that use aldehydes. If we can understand how to block mosquitoes from smelling these aldehyde chemicals, says Potter, we might be able to break new ground in the development of better mosquito repellents.